Извините, этот техт доступен только в “Американский Английский” и “Французский”. For the sake of viewer convenience, the content is shown below in this site default language. You may click one of the links to switch the site language to another available language. I met André Duval the day Johnny Hallyday died. I’d gone to Marne-la-Coquette after work to leave a rose; he’d been there since the morning, with nothing to eat or drink. 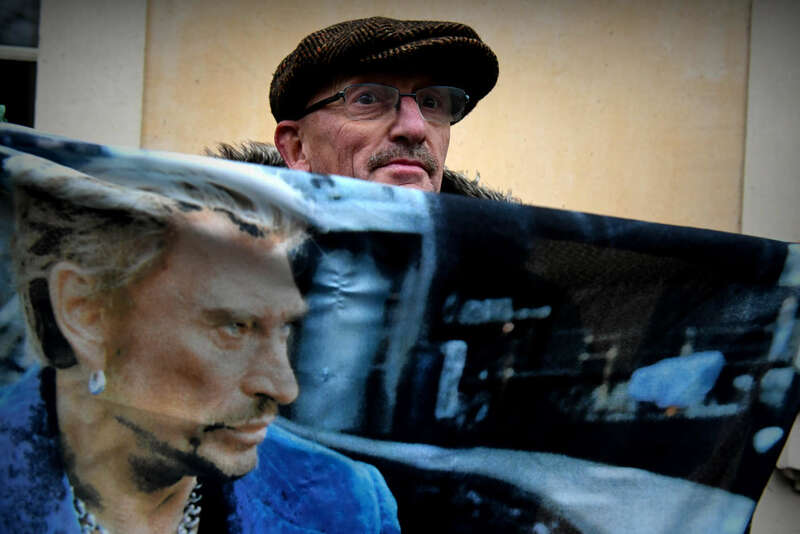 The Le Monde newspaper showed him holding his flag of Johnny, ‘the Boss’. After he folded it back up we went to have a drink. André had been a waiter at the Brasserie Hoche on Paris’s Avenue Hoche, and thanks to his profession he had served his idol. He was just as bound to his other passion: running. He had clocked up 60 marathons, all of them run, tray in hand, in his work uniform. Almost 70, he is one of the men behind the Foulées du Tertre, an event that takes in three loops of the cobbled backstreets of Montmartre. He gave me his card. It was 5 December, and winter would soon oblige me to hang up my bike. This 30th edition of the race would be an opportunity to start running again. I started on the banks of the river, my only aim to mix up my exercise and not get injured. The guys from the Jolie Foulée running club encouraged me. 6:45 a.m. at the Rotonde in Stalingrad, that was their programme! Thankfully it was a give and take : I went with them in the week and they came riding on the weekend. The big day came around very quickly. While many pro cyclists were heading into spring with Milan-Sanremo, I was getting ready to close the winter break with my first race number. Fate, however, would have it that winter was hanging grimly on. I would have liked a bearskin waiting around for the start, but I still had to run. Snow was falling, but that didn’t seem to bother the waiter in shirt sleeves, who carried the Foulée du Tertre’s 30th birthday cake without stumbling. On the line drawn in front of the market stalls of Sacré-Cœur people were smiling, as if they hadn’t quite counted on finding themselves in this situation. André arrived on his scooter. He hadn’t seen anything quite like it either. When the gun went, it was a leap into the unknown. How was the route? Were the cobbles slippery? I quickly regretted neglecting my intervals and my hill work. From one alley to the next the constant changes in rhythm seemed more like a punishment than a running race. The long false flat of the Rue Caulaincourt was agony. On the first loop I could barely see any more, but the spectators understood the situation and didn’t stop encouraging us. I took off my glasses and found a more personal rhythm, until we were only a little group of three in the wake of a courageous female runner. She got back to a group of firemen, who, in good humour, had got caught in the inflatable finish-line arch, which had collapsed. The race settled down further into the peculiar hammering of padded soles on wet cobble. One last hill behind Sacré-Cœur and the job was done. A nice old woman gave me my medal and I took a bottle of Powerade and wished that it was mulled wine. Around the food station people were starting to get changed, under the beady eye of the tourists. “How was it?” asked André. I smiled at him and gave him a thumbs up through my waterlogged glove. A few days later we caught up over a coffee. André had started running while he was doing his military service with the paras. In 1988, with some colleagues in the local police running club, the ‘Athletic Club Police 18’, they resurrected a race that the local town hall had let lapse. Les Foulées du Tertre was born. In those days, André was running every weekend, even every other day. Known for his waiter’s get-up, he took the line at the Paris Marathon, and, voillà, he was invited to New York and London. He often graced Sedan-Charleville and Marvejols-Mende, as well as the Maroilles 20km, with its incredible crowds of spectators. In those days running already had the wind in its sails, but it was still a family affair. A microcosm in which everybody knew everyone else, in which people would give each other a tap on the shoulder when they were overtaking and people always celebrated together afterwards, and the Foulées was no different, with its hearty meal and its musicians who kept the tempo up until it was time for the tombola. The grand prize? A night at the Cabaret Michou, the holy temple of after-hours Montmartre. This is more or less what I’d been looking for, here in this Parisian wonderland that makes Japanese tourists swoon and which Parisians – who we accuse of being so blasé – never tire of either. I know that a good time at a well-known event like the Paris Half would go down better at dinner parties, but I wanted to crown the off season with this social event, surrounded by athletes as well as Montmartre locals. It might have lacked a stall serving fatty foods – or even a tartiflette, given the conditions – for that ‘well-deserved refuelling’ afterwards, but that’s where it’s over to us runners, volunteers or part-timers. It’s up to us to look after what’s around us, and the events in our own neighbourhoods. Run them, help them, reinvent them if we have to. That’s how we can return the invitation. After 30 years of volunteering, out of love for Montmartre and for running, André has the right to put his feet up. And with the number of local brasseries opening in Montmartre these, days, we won’t have any trouble finding someone to serve him a celebratory drink!